Despite the cold, Mystic Aquarium in Mystic, Connecticut was full of visitors on New Year’s Eve. But one popular aquarium resident, an adult northern fur seal named Ziggy Star, was behind the scenes that day, recuperating in an off-exhibit habitat, complete with a private pool. When her trainers opened the gate, she stretched her neck up to say hello, with her head pointing back. Then, she bowed back down, exposing the shaved rectangle on the top of her head. The edges are straight and clean, and at the center, there’s a neat half moon of black stitches marking the spot where, in November, Ziggy had brain surgery—the first procedure of its kind done on a seal. Ziggy was rescued as an adult off the coast of California in April 2013, and traveled to Mystic after testing showed that she had neurological issues—difficulty controlling her movements, problems with vision—that would have made it hard to survive in the wild. For the past four years, she’s swam alongside three fur seal pups and an adult male, Sam, at the aquarium. But in September, Ziggy had a series of seizures, and was rushed up to the Cummings School of Veterinary Medicine at Tufts University. She was doing so poorly, and was so unresponsive, that she didn’t even need to be sedated for the MRI, said Ane Uriarte, the neurologist and neurosurgeon at Tufts who treated Ziggy. The scan showed that Ziggy had a condition called hydrocephalus: cerebrospinal fluid was building up inside her skull, putting pressure on her brain and causing it to deteriorate. She had some signs of it during her first MRI soon after her rescue, but on the new scan, it was significantly worse. Some of the symptoms, like the seizures, could be managed by medications. But medication wouldn’t help the fluid buildup, and wouldn’t actually do much to improve her quality of life. “The information we had from the MRI, and that she was clinically getting worse, guided us to do the surgery,” Uriarte said. In the surgery, which would drain the fluid and relieve the pressure on Ziggy’s brain, Uriarte drilled into Ziggy’s skull and fed a small tube into one of the ventricles, the fluid-filled cavities of her brain. The tube had to be placed precisely, so that it could hang freely without catching on any brain tissue. She then snaked it down into Ziggy’s abdomen, where the fluid would absorb harmlessly back into her body. The tube was anchored on a titanium plate outside the skull, and topped it with a valve, just under the skin, that controls the flow of fluid. The procedure is common enough in dogs and cats (and humans), but it had never been done in a seal. All brains and ventricles have different shapes, Uriarte said, so surgeons use MRIs to pinpoint the exact position on the skull to drill in. As a veterinarian, Uriarte said she’s regularly exposed to a lot of different types of anatomies. “Vets don’t just study one species.” Even dogs vary widely—chihuahuas and great danes, for example, have very different skulls. But dogs have specific landmarks on their skulls, Uriarte said, which makes mapping the scan onto the physical brain easier. “You can find the landmark, and then measure using that landmark,” she said. Seals, on the other hand, have smooth, round skulls, without distinctive features. “It was a little more challenging than with a dog or cat,” Uriarte explained. To prepare, the team had a seal skull flown in from California as a reference for the skull shape. “We spent much more time planning than actually doing the surgery,” she said. Despite the obstacles, the hour-long surgery, done on November 20, went smoothly. The next day, Ziggy traveled back to Mystic with a portable battery pack that kept her linked up to monitors for the drive home. It took her four days to wake up from the anesthesia. 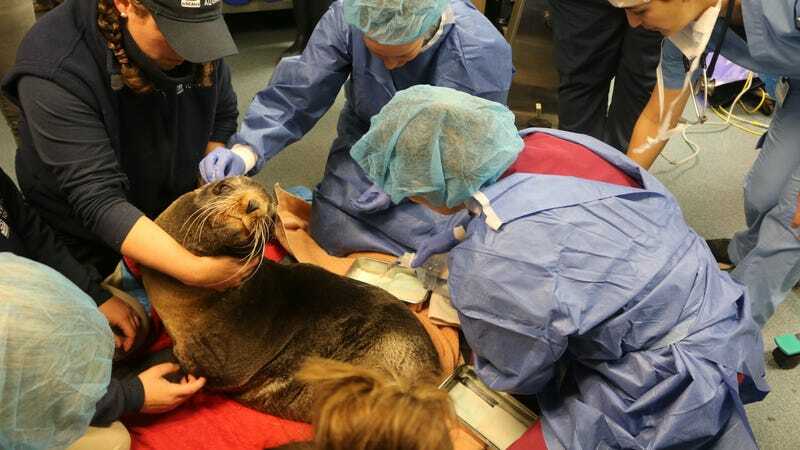 Marine mammals are already difficult to anesthetize, because of concerns that the drug can activate their dive reflex—which helps them conserve oxygen underwater by redirecting blood flow to the heart and lungs—and cause oxygen deprivation or cardiac problems. On top of that, Ziggy seems to be particularly sensitive to the effects of the drug, Uriarte said. Nicole Wetsman is a health and science reporter based in New York. She tweets @NicoleWetsman.